Diller Nursery, Inc. is a wholesale grower of landscape size plant material. 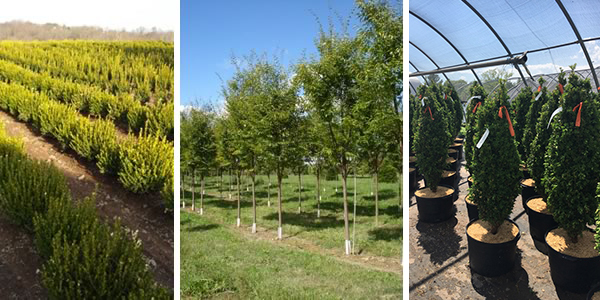 Our wholesale yard consists of a variety of flowering shrubs, broad leaves, evergreens, perennials, and grasses ranging in size from #1 to large boxes and pre dug B&B shade trees and evergreens for summer sales. Our sales yard also carries a variety of hard goods including tanbark, grass seed, fertilizer, wall stone, flagstone, screened topsoil, orchard ladders, tools, tree stakes, etc. Our field production consists of large hollies, shade and flowering trees, evergreens, and dwarf conifers. If you are a contractor, landscaper or garden center, we hope we can do business! If you are a homeowner please feel free to browse our site, but for information on plants please contact your local garden center, nursery, or landscaper. Thank you for visiting our site.